Students from the Sport Business Management Graduate Certificate Program. A class of about 20 students are working behind the scenes to create a large conference – expected to bring 300 people to campus. 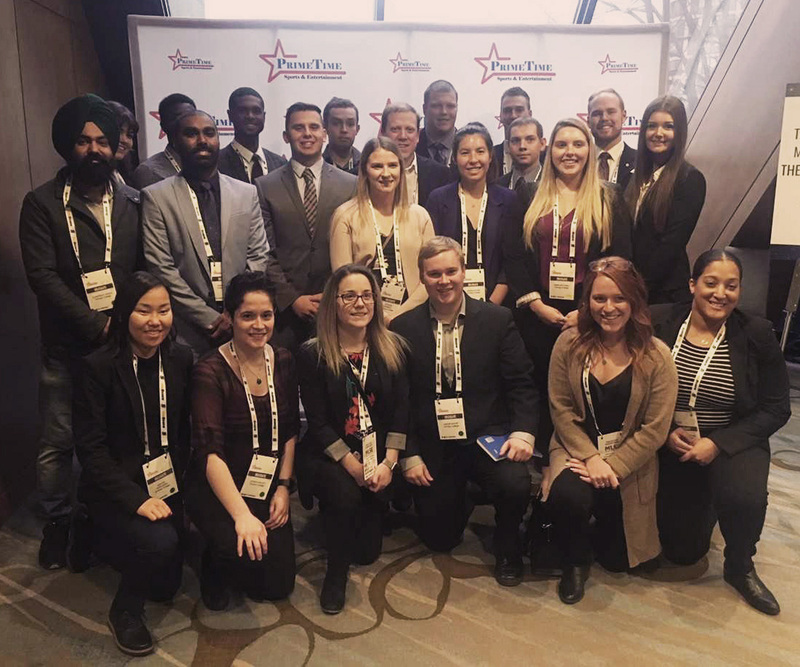 The ninth annual Durham College Sport Business Conference takes place on Nov. 29 and allows students and faculty to connect with sport industry professionals. Students from the Sport Business Management Graduate Certificate program are organizing the event, led by event co-chairs Mario Chiodo and Ryan Xavier. There are 14 guest speakers from all sectors, representing community, amateur and professional sport. Speakers from the Toronto Raptors, TorontoFC, TSN, Montreal Canadiens and the Oshawa Generals will be in attendance. Chiodo said the “not-for-profit” conference is an all-day event and will include panels, presentations and networking opportunities with guest speakers. Money raised at the conference will be donated to the Maple Leaf Sports and Entertainment [MLSE] foundation, which supports children in sports and recreation. Each year DC presents a new focus for its conference and this year’s theme is ‘The Future of Sport’. “Through their industry experience, [we want the guest speakers to] paint a picture of where they came from, where they are now and obviously looking toward the future,” Chiodo said. The conference is not only an organized, professional event; it is also a student project. Matt Akler, a professor in the sport business management program, said it’s important for students to have this experience. “With the students organizing, it’s important for them to get their practical experience in planning and running because they start from scratch,” he said. Students take classes in marketing material design, sales and financial budgeting. Akler said students apply information from these and other courses to the organization of the conference. Chiodo said his classmates are divided into committees, each with a department head. Students have roles in planning the operation, marketing and sponsorship of the conference, along with inviting the speakers. The conference will also include four community vendors, a silent auction, prizes and lunch. Tickets are $30 and $40 for a VIP experience that features early lunch, front row seats and individual conversations with industry professionals. Merchandise from sports teams will be on display and can be won, such as a basketball signed by the Toronto Raptors. What’s next for the students after the conference? A four-month long internship placement. Students could create and solidify their internship after networking at the conference, said Akler. Chiodo said the conference will benefit students as they try to land work in the future. Previous articleDurham’s esports: Let the games begin!